Italian Engraved Ivory Inlaid Rosewood Centre Table made for the Duke of Urbino Francesco Maria II Della Rovere (1549-1631), c 1596-7, and subsequently part of the collection of the Medici family. Est: £500,000-1,000,000. Photo: Sotheby's. LONDON.- On Tuesday 6th July 2010, Sothebys London will offer for sale a remarkable example of 16th-century craftsmanship  an Italian rosewood table, inlaid with ivory and finely engraved. In 1989 this same piece sold at auction for £6,000. More recent research by Sothebys specialists has revealed that in fact the table has a history and provenance befitting of its quality: newly-discovered documents reveal that this remarkable piece was once part of the legendary Medici family collection. The table will now be offered with an estimate of £500,000  1,000,000. Probably made by a German craftsman working for the noble families in Italy, the table was commissioned some time between 1596 and 1598 by the Duke of Urbino, Francesco Maria II della Rovere (1549-1631). The circumstances behind the commission are poignant: Francesco was born blessed with what, in 16th century Italy, was considered good looks, intelligence strength and courage, but after a brief moment of freedom and youthful indulgence in Spain in the 1560s, he was promised in marriage Lucrezia dEste, a princess of exceptional noble lineage, but a woman some 15 years his senior. Their loveless match did not produce the heirs their parents had hoped for and Lucrezia died childless in 1598. 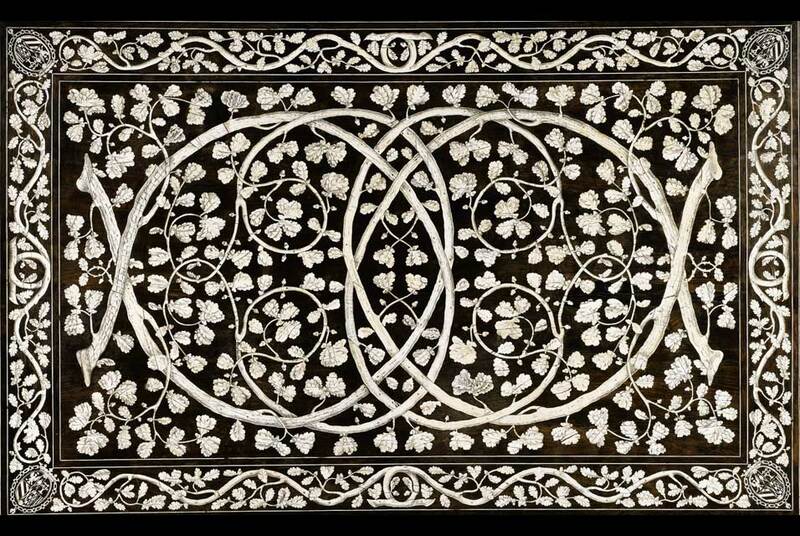 One year later, Fransceso married his sweet-heart cousin Livia della Rovere, and this table, together with a matching cabinet now in the Urbino Galleria Nazionale delle Marche, with their intertwining oak leaves, may well have been commissioned to celebrate the occasion. Their marriage produced a son, Federico Ubaldo, who in turn married into the Medici family. His daughter, Vittoria della Rovere, was born in 1623 and it was to her that Franceso bequeathed the table. He sent it to her in Florence just months before he died, knowing that when he passed away Urbino would be taken over by the Church and would no longer enjoy the independence and freedoms of his rule. The table remained in the Palazzo Pitti in Florence until the death of Vittoria in 1694. It then passed to her second son, Cardinal Francesco Maria de Medici. After this, all trace of the table was lost until it reappeared, some twenty years ago1, in a Christies auction, whence it had been consigned by the descendents of Charles Butler, whose collection also included, for instance, Titians Tarquin and Lucretia (now in the Fitzwilliam Museum in Cambridge), as well as pictures by Rubens, Bellini and others, many of which now hang in major national museums. Other lots in the sale include Royal Pliants made for Queen Marie Antoinettes Salon des Jeux at the Château de Compliègne (est. £150,000-250,000), The Baron Lionel de Rothschild Drinking Cups (ests. £60,000-80,000 and £70,000-90,000), an Armorial Casket bearing the arms of Prince William IV of Orange and Anne, Princess Royal of Great Britain (est. £200,000-300,000), Great Silver Wine Cistern of Thomas Wentworth, bearing the arms of Queen Anne (est. £1,500,000  2,000,000) a Boulle Secrétaire companion to the one in the British Royal Collections (est. £600,000-1,000,000), a Table for the 3rd Duke of Devonshire (est. £200,000-400,000), a Gold, Agate and Ormolu Musical Automaton Clock (est. £200,000-300,000), and The Stowe State Bedchamber Mirrors (est. £300,000-500,000).